We have 40,000+ products, 500 brands, and 2350 categories. This product is currently not available! Shop with us is safe. Guaranteed. Free Gift For Order Over $50. Check out our gift selection. Chronic fatigue is often a result of poor turnover of the atoms in your body. It takes about 18 months for a new atom to replace an old one. Scientists have found that a person's internal oxygen level determines how fast old atoms are loosened and dissolved. A shortness of oxygen causes and abundance of hydrogen which binds elements and solidifies them. 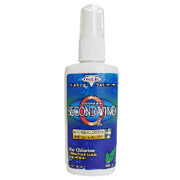 SECOND WIND, OXY-MAX and STABILIZED OXYGEN with COLLOIDAL SILVER give your body the oxygen it needs to promote fast atom turnover by keeping hydrogen levels in check and defying fatigue. Use 3 to 5 squirts under the tongue one or more times daily. Hold for 30 seconds before swallowing. **Daily Value not yet established. Second Wind Oxy Max - is shipped in a discrete, unmarked package. Orders are processed immediately and usually take about 3 to 5 working days to be received. We do ask that you try it for 2 to 3 weeks to feel the full effects. Any information received is used only for order processing and shipping purposes. Your information, such as e-mail address, will never be disclosed to a third party. DISCLAIMER: Information on this site is provided for informational purposes and is not meant to substitute for the advice provided by your own physician or other medical professionals. You should not use the information contained herein for diagnosing or treating a health problem or disease, or prescribing any medication. You should read all product packaging carefully. If you have or suspect that you have a medical problem, promptly contact your health care provider. Information and statements regarding dietary supplements have not been evaluated by the Food and Drug Administration and are not intended to diagnose, treat, cure, or prevent any disease. Products' pictures, labeling, and descriptions are subject to change by the manufacturers without notice. TakeHerb.com is not responsible for any incorrect or outdated product descriptions and/or images; as they do not necessarily reflect the latest information available from the manufacturer. Please contact manufacturer for latest product information. Designated trademarks and brands are the property of their respective owners. © Copyright 2016 Takeherb.com. All rights reserved.